I love Trader Joe's and can't wait till next year when I get to live closer to one of the stores. It is such a unique store, with their own interesting ingredients. Recently I got english peas there, they are not frozen and they are not in a can. They have a fresh and sweet taste to them. 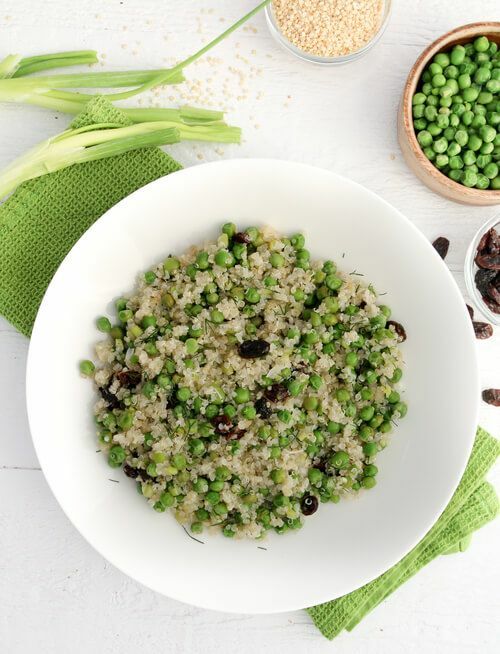 Perfect for fresh salads like this English peas Quinoa Salad. What do you love from Trader Joe's? Why should you eat more English Peas? These small rounded green goodness is filled with fiber, vitamins K, C, B6, B2, protein, iron, potassium, magnesium and even copper. What more health does this salad pack? Since this salad contains quinoa, this ingredient packs in a lot of protein but it is also high in antioxidants which benefit our overall health. This salad includes a special ingredient that heals gum diseases and cavities. It also packs in a lot of potassium and iron. If your'e thinking about raisins, you are correct. Raisins have so many health benefits. One of the last few ingredients I will mention from this salad that benefits our health is lemon. Your liver loves this citrusy fruit because it works as a dissolvent for uric acid and poisons. Another reason to love lemons is because it contains large antibacterial properties. In a small pot, add 1 cup of water with 1/2 quinoa. Boil for 10 minutes or until water is gone. Boil English peas for 90 seconds in water. Drain water and add the peas to quinoa. Add 1/4 cup raisins, juice from 1/2 lemon, 1/2 Tablespoon extra-virgin olive oil and a pinch of salt. Garnish with fresh dill (optional).